Everything looks great if you just make it up as you go. WASHINGTON (AP) — President Donald Trump is crediting his tariffs with persuading U.S. Steel to open a half dozen new plants. That’s not so. THE FACTS: The Pittsburgh-based company has made no such announcement. 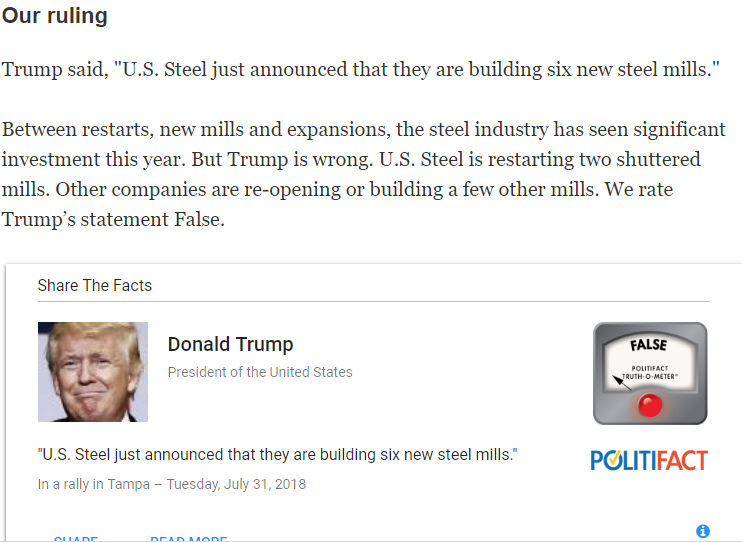 U.S. Steel spokeswoman Meghan Cox declined to comment on Trump’s claim but said any “operational changes” such as the opening of new mills would be “publicly announced” and “made available on our website” if it occurred. So Trump is breaking an announcement prior to US Steel being ready to announce it, got it. I imagine they shared more with him than they are ready to share with the world until the logistics are worked out. This is going to be another DaveLoon shoes thread I predict. But did you hear about Stormy Daniels and the Illegal immigrants kids? Oh and Trump plays slightly more golf than Hussein did. I really do have a problem with Trump and his obsession with girly ball. The more I think about this, I am guessing he meant US steel companies, not the individual U.S. Steel. Sure, I can see where one equals six. No big deal to me, just another example.